Subject: Second Meeting of the Anomaly Committee on the calculation methodology of the Disability Pension for Defence forces personnel as per the recommendations of the 7th Central Pay Commission. 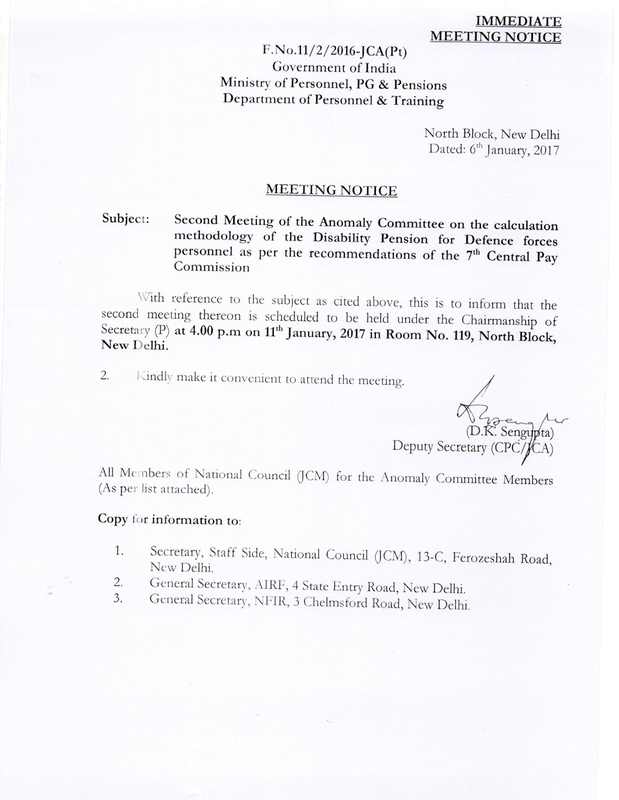 With reference to the subject as cited above, this is to inform that the second meeting thereon is scheduled to be held under the Chairmanship of Secretary (P) at 4.00 p.m. on 11th January, 2017 in Room No.119, North Block, New Delhi. Second Meeting of the Anomaly Committee on the calculation methodology of the Disability Pension for Defence forces personnel as per the recommendations of the 7th Central Pay Commission will be held on 11th January, 2017.